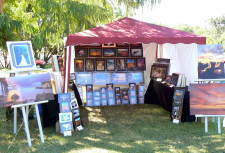 The annual 'Hi to the Dry' Darwin Craft Fair and Open Day is held in the Northern Territory Museum and Art Gallery grounds by Territory Craft. 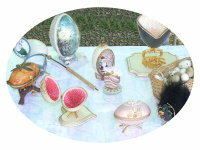 Come and see hand crafted glassware, jewellery, paintings, and clothes on display amongst shady trees and green slopes. The Craft Fair provides an opportunity to see work by people who really are passionate about their craft but not interested in a weekly stall at the various markets around Darwin. Territory Craft holds three Craft fairs through the year. If you missed "Hi to the Dry", the next is held in the middle of the Dry season. 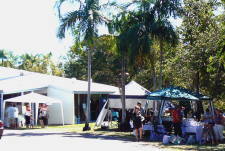 The Dragonfly Craft Fair is held in the middle of the dry season in the Museum grounds in Conacher St Fannie Bay. 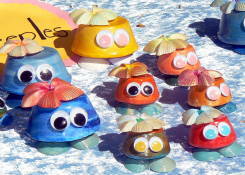 With around fifty craft stalls as well as food and refreshment this is a real family day. Then the Christmas Craft Fair will once again be held on a Sunday in November. This fair has traditionally held a festive atmosphere with wandering carolers and other entertainers at Territory Craft Gallery, Conacher St. Fannie Bay (next door to the museum). Read more about the Markets and Art Galleries in the Darwin area. Return from Territory Craft Expo to Enjoy Darwin Home.